As with any new tech tool that claims to make our work lives substantially easier, there’s often a lot of talk surrounding HR technologies. And when there’s talk, myths undoubtedly form. But they’re just that — myths. It’s only natural to want to avoid things we don’t fully understand, especially when those things involve seemingly complicated tech and hefty instruction manuals. It’s all too easy to pass on the latest trends and tools and stick with what you know. After all, it worked for the employees before you, and it works now. So, why fix what isn’t broken? It’s simple: The human resources industry is constantly evolving, and HR professionals need to adopt the latest tech tools in order to keep up. Myth #1: It’s more trouble than it’s worth. You know your hiring process inside and out. You’ve been doing things the same way for years, and your predecessors did the same before you. Adding new technology to the mix will only complicate things. First, you need to get up to speed with the program. Once you’re familiar with the technology, then you’ll need to train your staff to use it. A simple piece of technology designed to make your work easier is now taking away valuable time and creating headaches for everyone involved. Once you think everyone has a handle on the new HR tech, something goes wrong. There’s a bug or an update, and you either need to spend hours on the phone with tech support, or dig for the answers yourself online. The reality: It’s worth more trouble than it is. For the most part, HR tech is designed to simplify your life — not complicate it. While learning how to navigate and optimize a new tech tool can seem like a time-consuming process, more often than not, it’s a lot easier than it looks. As technology advances, it becomes increasingly easy for users to get started with a new tool. Remember when you made the switch from your desktop to your laptop computer? Or switching from a flip phone to your first smartphone? The change seemed scary at first, but after some time, updating your technology paid off and made your life much simpler. HR tech is the same. Initially, it may require a time investment to learn and set up, but in the long run, it’s worth the time and frustration. With cloud-stored data, getting started with HR tech solutions is simple. Many tools are easy to navigate and feel a lot like using a new app — not using and learning an entire new technology. With cloud-stored data, getting started with #HRTech solutions is simple! Myth #2: Vendor relationships are troublesome. When you work with a vendor, everything isn’t in your control. If there’s a problem, you have to wait for their response. If you need help, you have to send an email or set up a phone call. Vendor relationships are nerve-wracking partnerships. You’re not a vendor’s only client, and therefore, not their first priority. When something goes wrong, how long will they take to deliver the help you need? Hours? Days? Weeks? What will these delays do to your hiring efforts? Vendors bring in another layer of complication — more relationships. An HR tech tool may be the perfect solution for your specific hiring needs, but the people are difficult to work with. Or, you may love the people who work behind the vendor, but their solutions are too generic. They’re not listening to what you need or customizing their product. The reality: HR professionals enjoy working with their tech vendors. In fact, in Key Interval Research’s report, The Ideal Vendor Relationship, a whopping 87 percent of the 1,100 HR practitioners surveyed reported enjoying their tech vendor relationships. “This is not the story we expected to hear,” authors William Tincup and John Sumser admit. Although you may have heard horror stories about working with different tech vendors, HR tech companies have your best interests at heart. Their business is to create solutions HR professionals love to use and to help them along the way. How long did they take to return your emails and calls? Do they have a specific contact person for you? Are they the same person to call for technical issues? Do they understand your brand and have they tailored solutions to meet your needs? Myth #3: Tech doesn’t deliver on its promises. There’s a lot of buzz surrounding HR tech and what it can do. But you don’t care about buzz; you care about results — does the tool do what it says it can do? You have your doubts. The technology is relatively new, and measuring results from a few clients isn’t that reliable. You’ve seen this happen before. A new product or service is hyped as “the next big thing” and then it doesn’t work. There are a number of problems. Promised features, for instance, are only in beta testing and can’t be used yet. Your results aren’t as great as the company advertised. Now you’ve invested both time and money with little to show for it. The reality: It’s easy to dismiss seemingly outrageous claims made by HR tech vendors. But, the fact of the matter is, people don’t often make claims they can’t deliver on — it’s bad for business. The aforementioned Key Interval Research report revealed that the majority of practitioners say their HR software often or always delivers what the vendor promised, a view that’s strongest among practitioners at the largest companies. And that’s saying a lot. Myth #4: There’s no way to test for success. You’ve implemented a new HR tech tool and things seem to be running smoothly. You’ve had no major incidents, and you think your recruiting process is speeding up. Some of your team members have commented about what they like about the new tool and how it’s helping them. But is the tool really helping you reach your goals? Is there an objective way to measure results? Video interviews: Video interviews are all about speed and screening. To measure its impact, compare time-to-hire before and after using the tool. Look at the breakdown of time spent on each phase of the hiring process. How much time passed from when a candidate was sourced to when they were screened, interviewed, and eventually hired? Applicant tracking systems (ATS): Modern applicant tracking systems actually help you collect, analyze, and store data to make more informed hiring decisions. An ATS can track how long it takes to review resumes, offer and acceptance ratios, and more. You can clearly see where the process is running smoothly, and where the kinks need to be worked out. Additionally, your ATS can also help keep track of your sources of hire, which can help determine which sources you should invest more in for the best results. Automated benefits enrollment: To measure the impact of automated benefits enrollment, measure the amount of time required to complete each part of the enrollment process manually. Then, look at the cost of that manual labor for an entire year. Compare that cost with the cost of the automated system and the reduced cost of manual labor needed. How much time and money can the automated system save you? Talent management solutions: Talent management is a little more subjective, but it can still be measured. Look at employee satisfaction, turnover, and retention. Ask employees about the tools you’re using and how they’re helpful or not helpful. Is the tool helping them succeed? 4 #HR technologies you NEED to implement today! Myth #5: Tech takes the “human” out of human resources. You’re constantly using technology to communicate. You’re texting your team members, emailing candidates, and messaging your boss regular updates. Technology is supposed to make you more connected, but you actually feel disconnected. You can’t remember the last time you had a face-to-face conversation at work that lasted more than two minutes. In hiring, this concerns you. How can you properly hire the right person, if you never get to know anyone? Will more technology make building authentic relationships with candidates more difficult? You just want a good old-fashioned conversation to identify the best candidate — not an emoji-filled chat. The reality: If anything, technology puts the human back in human resources. HR tech isn’t designed to take over the HR professional’s job, but to automate time-consuming processes and free up time that can be better spent with employees, thus throwing you — the human — back into HR. And job seekers want both a speedy process and a human connection. A 2014 survey from CareerBuilder found that 61 percent of candidates surveyed want employers to respond quickly throughout the process and want to be notified when they are not the right fit. In addition, 56 percent want to be updated about their application process. These needs can be tackled by HR tech through automated notifications. At the same time, job seekers still want to build personal connections. According to the survey, 67 percent of candidate respondents expect a personal call from a recruiter or hiring manager. 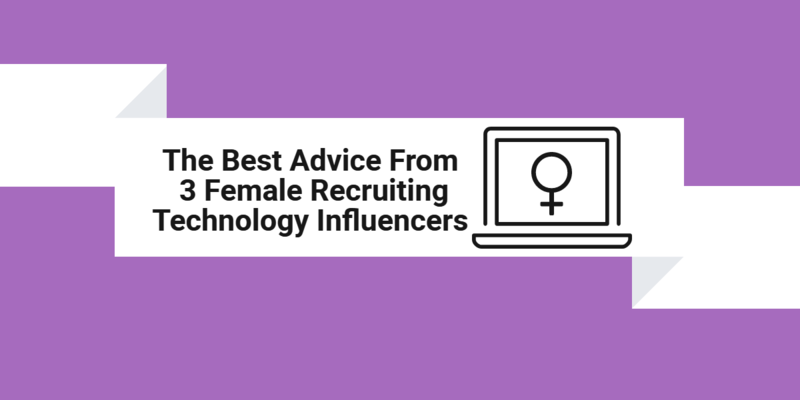 While your HR tech handles tedious tasks, you can be free to make those personal calls and spend more time getting to know your most promising candidates. Myth #6: No one is using it. HR tech is shiny and new, but is anyone actually using it? You’ve asked a few of your colleagues and other hiring professionals in your network and they all hold similar opinions. The technology could bring benefits, but it’s also a big risk. 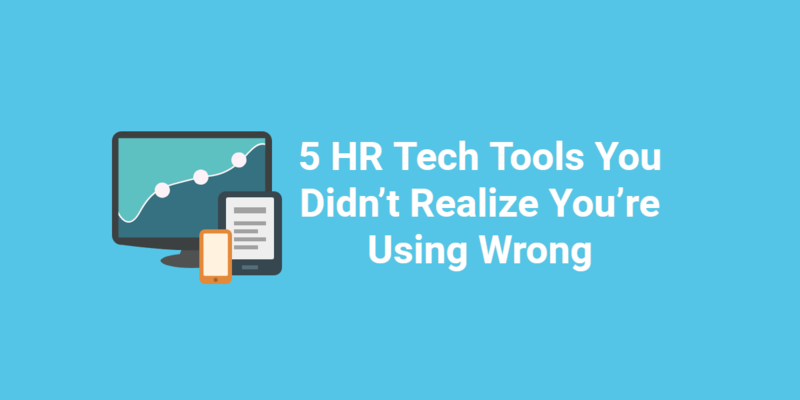 You don’t know a lot of people who are using innovative HR tech, and you’re not convinced you should invest in something that the rest of the industry doesn’t deem valuable. The reality: With 53 percent of all organizations reporting that they plan to increase their spending on HR tech in the next year, according to Sierra-Cedar’s HR Systems Survey, you can bet a lot of people are using it. Hiring professionals are testing the waters with HR tech and are slowly adding new tools to find the ones that work best for them. In this testing phase, companies are carefully watching their results, not advertising which products they love. Tech tools are evolving everyday, and keeping up with the latest HR technology may seem like a fight not worth getting involved in. But if you ignore new tools, you’re ignoring opportunities to improve your hiring process and find better talent. When looking at HR tech, ignore the myths. Instead, focus on what’s best for you, your team, and your organization. 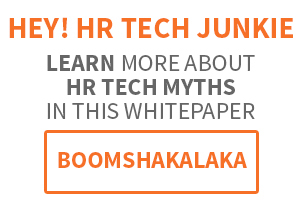 What HR tech myths have you heard? Let us know in the comments!